Wangford village stretches along a street which once carried the main London to Yarmouth road. It must have been hell. Today, the village is bypassed, and the road is a peaceful little cul-de-sac of the loveliest 18th and 19th Century houses, as well as a pub and a shop. 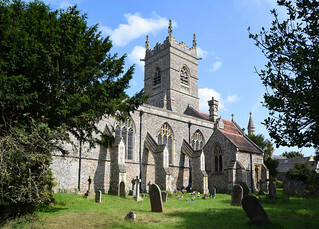 The village is not to be confused with the ghost village of Wangford St Denis near Lakenheath, on the other side of Suffolk. 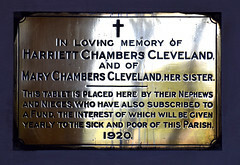 The church sits on the southern side of the street in as wide a graveyard as you can imagine. It rises above the flat expanse, looking quite unlike any other church in the county. The more you look at it, the stranger it appears, like nothing quite so much as a North London Anglo-catholic creation of the 19th century, decked out in flint and trimmed with Suffolk features. And that is almost exactly what it is. 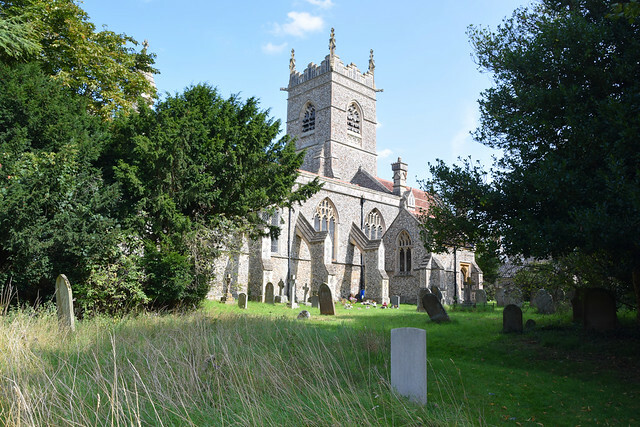 The church here was, like most in Suffolk, pretty near derelict by the mid-19th century. It was all that survived of a Cluniac Priory, a cell to the mother Priory at Thetford over the border, but must still have been fairly substantial, even before falling under the patronage of Henham Hall. The Hall, now gone, sat in its park in the hamlet of Henham a bit to the south, on the other side of the A12. It is best known today for the Latitude Festival held in the grounds each summer. 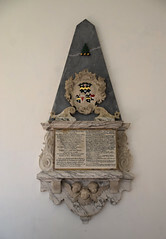 Henham was within the parish of Wangford, and never had its own church, and so it was that the Earls of Stradbroke, owners of the Hall, set about memorialising themselves here in Wangford church. The architect was A. L. Blackburne. First, the whole building was demolished apart for the nave walls. Next, a tall beturreted chancel was added at the east end, and beside it in the 1870s, a grand tower. 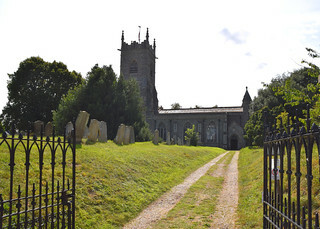 Dallinghoo, to the south, also has a tower at the east end, but that is because it is a former cruciform church which has lost its chancel and transepts. Here, the plan was deliberate, and successful. The top of the tower was finished in the 14th century Suffolk manner. 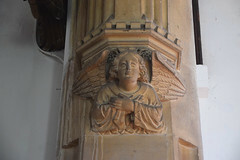 So it sits there at the east end of the north aisle, while inside, the west end of the nave has a huge window, which may possibly be the refashioning of a tower arch. On the south side of the church, massive flying buttresses support the nave wall, perhaps necessarily or maybe just as an adornment. Coming back here in 2017 after some fifteen years away, I was struck by the sheer quality of what was done here at Wangford. No expense was spared. 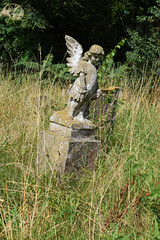 I wandered around the south side, where to my surprise I found the beeman tending to hives in the south-east corner, moving surreally among the headstones in his beekeeper suit. 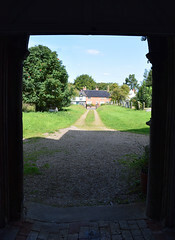 I wandered around past what appears to be a Victorian rector's garage to the east of the church, and in through the north porch, which is the only other medieval survival. Its remoteness from the tower gives the illusion that you are entering the building from the wrong end. 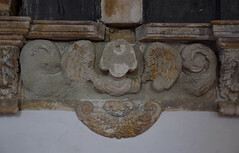 It seems to have had a side sliced off it by the buttress to the north aisle. 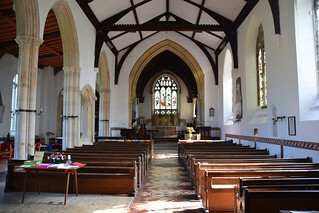 You step into what, to all intents and purposes, appears an urban church, but one ruralised through the usage of the last century and a half. 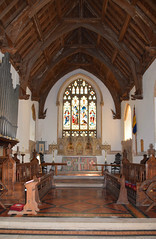 Because of the width of the north aisle, the long chancel appears offset in the south-east corner. 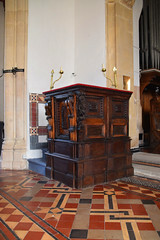 Either side of the chancel arch are two curiosities, a reading desk and a pulpit. 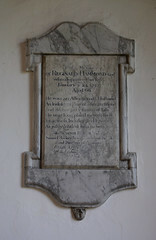 They are said to have been brought here from the chapel at Henham Hall, and to be 17th century Flemish. Perhaps they were actually made out of Flemish panels taken from the Hall. 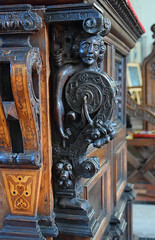 They are glorious affairs of inlaid wood and varnish, with carvings reminiscent of ship figureheads buttressing the corners. 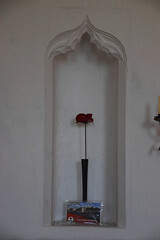 An image niche on the south side of the nave contains a memorial poppy from the Bloodswept Lands and Seas of Red exhibit at the Tower of London to commemorate a hundred years since the start of the First Wolrd War. 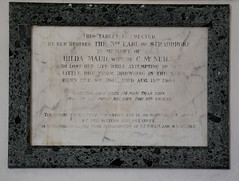 At the west end of the nave a simple plaque of 1904 remembers Hilda McNeill, who lost her life while attempting to save a little boy from drowning in the Taw. The sanctuary is still dressed in its ritualistic 19th Century pomp, with a mighty gilded stone reredos. Suffolk angels look down from the roof. 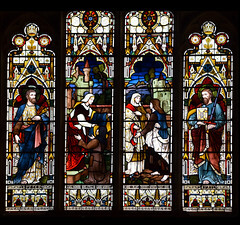 Heaton, Butler & Bayne's four light east window depicts the Works of Dorcas flanked by St Peter and St Paul, the parish patron saints. Some excellent glass on the south side depicts two of the Holy Kinship, with the Blessed Virgin reading scripture to the young Christ on one side, and St Mary Cleophas reading scripture to the young Saints Jude, Simon and James on the other. 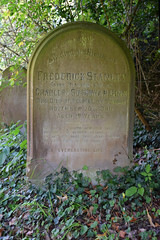 It remembers Frederick Charles Bonham, who died at the age of eight in 1863. Unfortunately, no one seems to know who it is by. 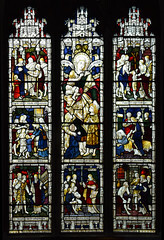 Clayton & Bell's early 20th Century window of Charity and the Works of Mercy is a little indifferent in comparison, but the 1880s west window is strikingly different to all, one of Suffolk's few windows by the Gibbs & Howard workshop, depicting Christ clearing the moneychangers out of the temple, Solomon building the temple, and the ark of the covenant being carried in the desert. All around, the walls are lined with mementos to the Earls of Stradbroke, and as you might expect they are all high quality. 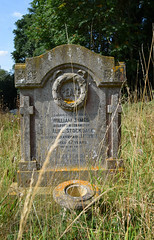 But there is another memorial which is quite different. 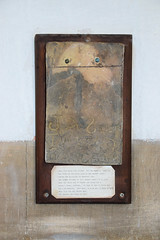 Up in the sanctuary, there is a charming little display of a tile inscribed with Jas Ife, Oct 5 1873 WANGFORD. 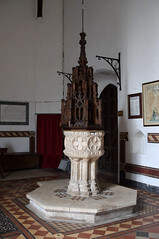 It was recovered from the chancel roof after a repair. a note below it tells us that the 1871 census returns show James Ife living in Wangford village, that he was fifteen years old at the time he made the tile, and that he gave his occupation as a brickmaker. A rather different touchstone to the 19th century than the huge, fine building that contains it.